The Casebook of Gregory Hood began as a summer replacement for Sherlock Holmes over Mutual written by Sherlock Holmes writers Denis Green and Anthony Boucher. When Sherlock Holmes didn’t return, the series continued to air through the whole 1946-47 season and would return in 1948 with Elliot Lewis in the lead before moving to ABC and continuing to air episodes into the 1950s. The series followed the adventures of Gregory Hood, a suave bachelor San Francisco importer who also found himself often constantly involved homicides. He’s aided in his adventure by aide the more down to earth company attorney Sanderson Talor. 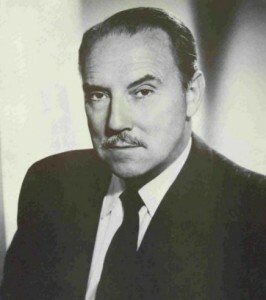 Gale Gordon (1906-95): For fans of classic television, Gale Gordon earned a reputation for playing crochety authority figures. He was the second Mr. Wilson on the classic Dennis the Menace series and in his association with Lucille Ball in programs like Theodore Mooney in The Lucy Show and Harrison Carter in Here’s Lucy. 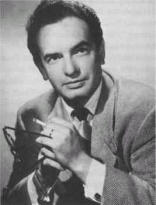 Elliot Lewis (1917-90) was often known as Mr. Radio. His career over the air was multi-faceted and has left an indelible mark. He was a talented dramatic actor. He played Captain Philip Kearney in the well-remembered Voyages of the Scarlet Queen. He also took his turn as a radio detective in both The Casebook of Gregory Hood and played Archie Goodwin in Mutual’s Amazing Nero Wolfe, and then starred with his then-wife Cathy Lewis in On Stage which pushed him into a wide variety of genres. Jackson Beck (1912-2004): Jackson Beck had many roles in radio. He starred for Ziv as that once-popular private detective Philo Vance. However, where he really distinguished himself was on Superman. He’s best known as the announcer of that program who delivered the show’s memorably opening. However, Beck showed flexibility by not only announcing, but also acting in the show. As the Jimmy Olsen character grew up on the radio, he took on the role of Beany Martin, a copyboy. He also had the distinction of being the first actor to portray Batman’s butler, Alfred Pennyworth. His contributions to radio drama continued long after Superman left the air in 1951. He was probably the biggest to appear on the radio in the September 30, 1962 golden age of radio finale as he appeared in “The Tip Off Matter” on Yours Truly Johnny Dollar. He continued to make radio appearances frequently with numerous appearance on radio revival shows such as Theater Five, the General Mills Adventure Theater, and The CBS Mystery Theater. Hi, is there a video of you somewhere? I can’t match your voice to the picture on amazon and I like to be able to imagine you talking to us… at the moment in my mind you look like the guy who sits at the desk in who’s line is it anyway. Thank you for doing this podcast, I love anything of the old days and am currently bedbound and watching tv makes my head pain worse so I am listening to mysteries instead of watching them.